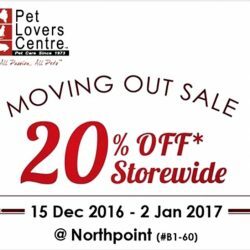 Pet lovers, dun miss the storewide 20% off sale at Pet Lovers Centre @Northpoint! Head there by 2 January to stock up on your pet supplies! 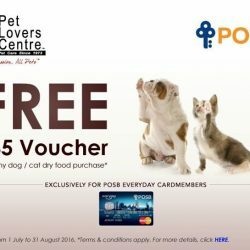 Till 31 Aug 2016 Pet Lovers Centre: Exclusively for POSB Everyday Cardmembers, get a $5 voucher with ANY dog or cat dry food purchase! 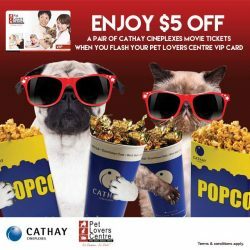 Exclusively for POSB Everyday Cardmembers, get a $5 voucher with ANY dog or cat dry food purchase! Up to 10% further price reduction on your favourite brands plus enjoy the usual VIP 5% Member or 15% Birthday Month Savings* too! 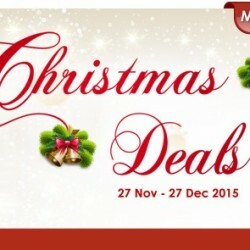 Enjoy their Festive clearance sale available now. Up to 200 products for grabs from as low as $1 Visit here to check out these hot deals. Term and condition apply. 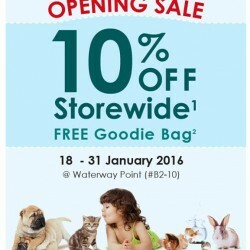 They are open at Waterway Point on 18 Jan at 10am. See you there! Enjoy opening sale 10% off storewide with free Goodie bag. 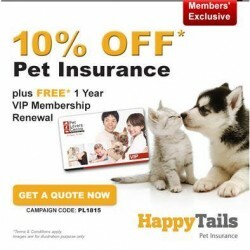 Enjoy free 1 year VIP membership renewal when you protect your furkids with Happy Tails pet insurance! Get 10% discount when you enter campaign code PL1815 during your online purchase. Get your quote at here today! Note: Approved policyholders would receive a redemption letter for the VIP membership card. 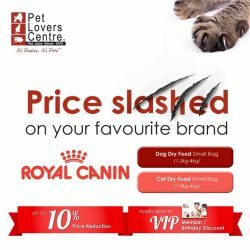 Pet Lovers Centre enjoy Up to 60% OFF selected items. Visit them for more detail. Terms and conditions apply. 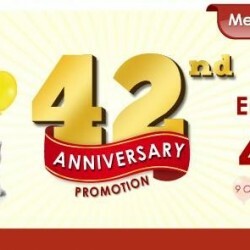 Enjoy up to 42% off Pet Products in their 42 Anniversary Promotion! 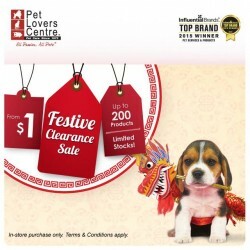 Valid from 9 Oct to 1 Nov 2015. Click the links below for more details. For desktop device users click here. For mobile device users click here. 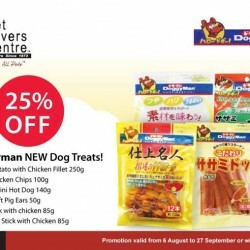 Enjoy this Doggyman New Dog Treats with Sweet Potato with Chicken Fillet 250g, Small Chicken Chips 100g, Sasami Mini Hot Dog 140g, Sliced Soft Pig Ears 50g, Gum Stick with Chicken 85g, Soft Gum Stick with Chicken 85g. Promotion valid from 6 August to 27 September or while stocks last. 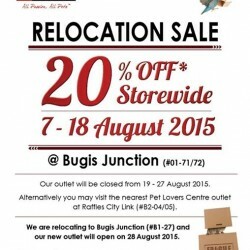 Enjoy this Relocation sale and get up to 20% OFF storewide this promotion is valid till 17th August 2015 alternatively you may visit the nearest pet lover center outlet at raffles city link (#B2-04/05). Term and Conditions Apply. Attention to all! 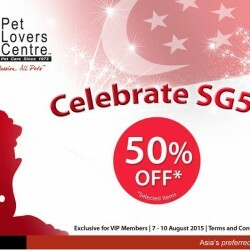 Pet Lovers Centre celebrate SG50 and offers 50% OFF selected items. Valid from 7 to 10 August 2015. Get this chance right now of great discount. Terms and conditions apply. 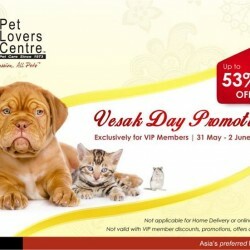 Enjoy and get Up to 53% off with your pets this Vesak day promotion Exclusively for VIP members. Time: Open daily from 10am to 7pm. Burp! 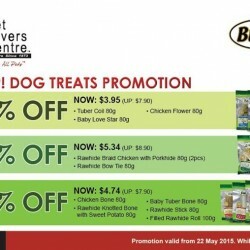 Dog Treats Promotion is here! 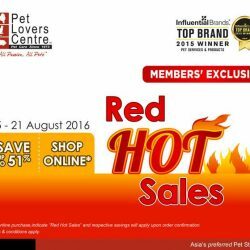 Pet Lovers Centre Singapore offers you up to 50% off on their Dog products. Promotion valid from 22 May 2015. While stocks last! For more info, please visit any of their stores. 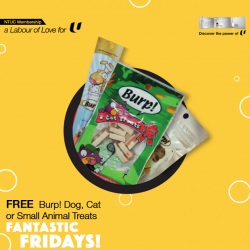 Enjoy and Give your pet a Treat every Friday this May! 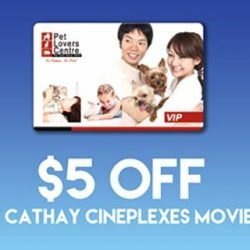 Flash your NTUC card to redeem FREE Burp! Dog, Cat or Small Animal Treats at Pet Lovers Centre on Fridays. 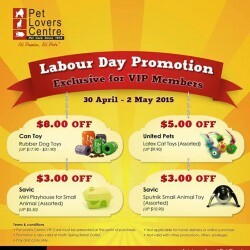 3 Days Labour Day Promotion at Pet Lovers Centre. Exclusive for VIP members! 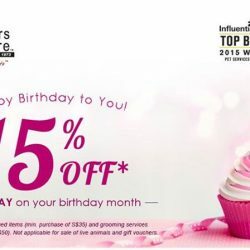 Valid 30 Apr - 2 May 2015. 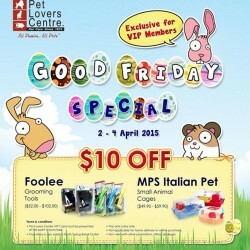 Good Friday Special Exclusive for VIP members at Pet Lover Center! Hurry, promotion valid from 2- 4 April only. 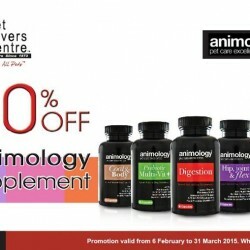 Get your best friend protected with as low as $0.34 per day with 30% off Animology Dog Supplement at Pet Lovers Centre. Pet Lovers Centre offers 1st Choice Cat Tunnel to give your cat a space to play, and collapse for easy storage when playtime is finished. 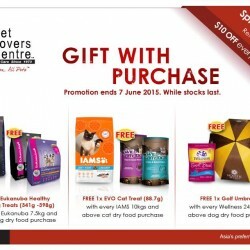 Simply purchase 2 packets of 2.72kg 1st Choice Cat Dry Food and enjoy $2.50 OFF and 1 Free cat tunnel. Specially formulated to thoroughly clean and deodorise ear canals. 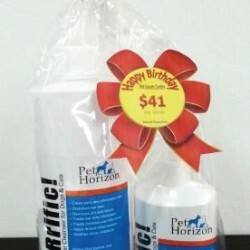 Controls ear mites and ear infections. Great for healing sore, irritated, and infected ears. 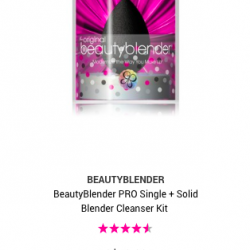 Gently and effectively removes dirt and dissolves waxy build- up.